Clarets boss Sean Dyche chose to look at the positives after a frustrating night at Turf Moor. 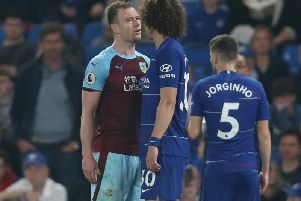 Burnley were held to a goal-less draw at Turf Moor by Cardiff City - a third-successive draw - as their lead at the top was cut to a point by Middlesbrough, with Brighton a further point behind. The Clarets are 17 league games unbeaten, however, after a 16th clean sheet, and Dyche said: "It was a frustrating one I think, with the quality and amount of chances we made. It could have been a travesty, but they had a breakaway and hit the bar, which would have been a strange night at the office, but we’re scratching our heads as to how we haven’t put one of the chances in, because normally - we're the highest goal scorers in the division - we do put them away. "There were a couple for Boydy, the one from Andre, a header from Ben Mee from a corner, then second half we had three really good chances, some great play from Joey and Lowts to get Vokesy in behind - he gets his foot on it but not cleanly - Vokesy's header at the end from a fantastic ball from Matty Taylor, and Barnesy, where the keeper makes another save. "We certainly made enough, Tom Heaton had nothing to do other than clean hands all night, bar one breakaway." After three draws, the promotion picture has tightened right up, but Dyche added: "I have to look at the whole season. Add those three draws after six wins on the trot you wouldn’t bat an eyelid. "That’s the reality of it. From Boxing Day we’ve come from eight points behind the top boys, who had a game in hand as well, and we're top of the league, so there's a lot of good work been done and a lot more to do. And it is work, there are six really big games coming up and they're all important." Dyche was again pleased with his players' physicality, keeping going right to the final whistle: "The way the players are physically at this stage is fantastic, they were on the ropes for the last 15/20 minutes, we've opened up the play and looked for many different ways to try and win it, and I was really pleased with the mentality, to be creating those chances, particularly so late in the game. "The mentality of the players is very important. Myself, the staff, how we look after them, the sports science team, the physios, and as you saw, there’s plenty of energy, legs and endeavour and real quality and that's the mix you need. That's going to be important. "We’re showing good signs of our mental strength, to grip that game second half and still be creating chances in the last minutes shows we're in it to win it and doing everything we can.